Ever wonder what makes those large holes you see in some yards? 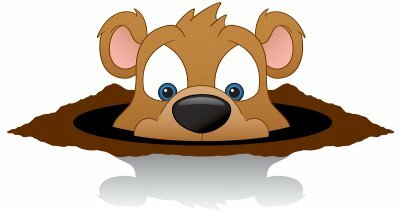 If you live in Canada or the northeast part of the United States, the hole was likely made by a "groundhog". The groundhog goes by many names - woodchuck, whistle-pig, and even land-beaver. It belongs to the family of animals known as "marmots". Groundhogs can even be found as far as Alaska. In areas lacking predators, groundhogs can grow as large as 30 inches long, and weigh up to 31 pounds. Claws assist groundhogs in digging holes in the earth, and two coats of fur keep them warm during the colder months. Groundhogs can live to be 9 years old but they need to watch out for predators like wolves, bears, hawks, and dogs. While groundhogs are furry and cute, they can be dangerous so it is best to stay a safe distance away from them.